PatterNodes is a procedural design to for creating graphical patterns, animations or illustrations based on repetitions. This is done by defining a sequence of steps that describes the design, using nodes and connections between them. 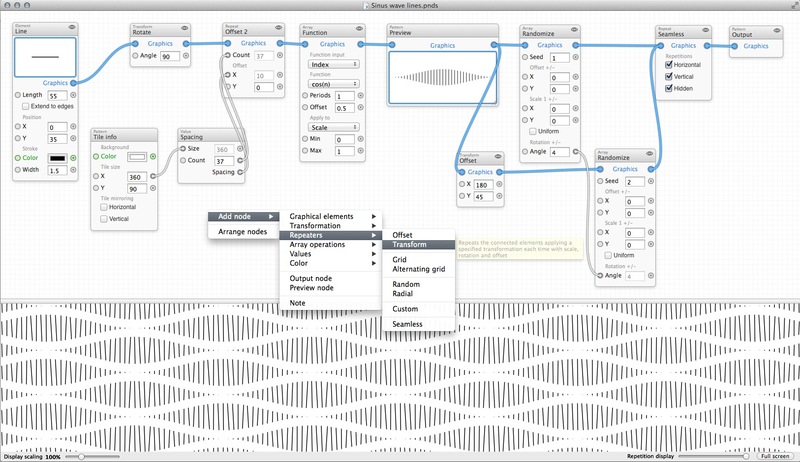 PatterNodes is designed from the start to make it easy to tweak things to see how they turn out. Therefore the resulting design output is always shown in the bottom preview view, repeated for patterns and updating in real time with any changes, giving you instant feedback of what the end result will be. While the software can be used to create many types of illustrations and animations it's primarily aimed at pattern creation. To make pattern creation easier PatterNodes also includes a lot of nodes that automatically perform common tedious tasks like repeating elements at the tile edges to make the pattern seamless, or randomizing different aspects (like color, position, rotation..) of the elements in a pattern to give it a little more life.